Robin Williams, the much-loved Hollywood comedian and actor, has been found dead at his home in California in an apparent suicide. The 63-year-old Good Will Hunting star was found unresponsive by paramedics in his house in in Tiburon, north of San Francisco, at around 11:55 am on Monday. He was pronounced dead at the scene. The cause of death is believed to be suicide by asphyxiation, according to the local coronerâ€™s office. Mara Buxbaum, his spokesman, released a statement saying he had been struggling with depression in the last few months. His wife Susan Schneider paid tribute to her husband, who celebrated his birthday last month: "This morning, I lost my husband and my best friend, while the world lost one of its most beloved artists and beautiful human beings. I am utterly heartbroken. On behalf of Robin's family, we are asking for privacy during our time of profound grief. It is believed this is one of the last photos of the actor which he shared via Instagram with the caption: "Happy Birthday to me! A visit from one of my favorite leading ladies, Crystal." US television channels broke into scheduled programming to announce Williams' death, and fellow actors and comedians used social media to express heartbreak and grief. President Barack Obama led the nation in tribute, releasing a statement which said: "He was one of a kind. He arrived in our lives as an alien - but he ended up touching every element of the human spirit. He made us laugh. He made us cry. "He gave his immeasurable talent freely and generously to those who needed it most - from our troops stationed abroad to the marginalised on our own streets." Pam Dawber, Williams' co-star in Mork and Mindy, the television show that catapulted him to fame, said: "I am completely and totally devastated." A close friend of Billy Connollyâ€™s, Williams enjoyed a visit to the Big Yinâ€™s Strathdon property on several occasions. Stellan SkarsgÃ¥rd who was starred in Good Will Hunting with Williams described the talented actor as "exciting" to work with. "It was like he had three brains which were constantly revving," SkarsgÃ¥rd recalled. "He could say absolutely anything. No take with him was like any other, and it was immensely exciting," he said. John Travolta, his co-star in the film Old Dogs, said: "I've never known a sweeter, brighter, more considerate person than Robin. Robin's commitment as an artist to lifting our mood and making us happy is compared to none. He loved us all and we loved him back." Fellow comedian and Father of the Bride actor Steve Martin said: â€œI could not be more stunned by the loss of Robin Williams, mensch, great talent, acting partner, genuine soul. Within an hour of hearing the news, the titles of some of his best-known films were the top "trending topics" on Twitter, including Mrs Doubtfire, Good Morning, Vietnam and The Birdcage. David Steinberg, his manager of 35 years, said: "Nobody made the world laugh like Robin Williams. My brother, my friend, my soulmate, I will miss you." Williams last posted on his Instagram account two weeks ago, which showed him in happier days with his daughter. "Happy Birthday to Ms. Zelda Rae Williams! Quarter of a century old today but always my baby girl. Happy Birthday. Love you!" it said. His daughter Zelda, who recently celebrated her 25th birthday, later posted an excerpt from French poet and aviator Antoine de Saint-Exupery's El Principito, which read: "You - you alone will have the stars as no one else has them...In one of the stars I shall be living. In one of them I shall be laughing. And so it will be as if all the stars were laughing, when you look at the sky at night...You - only you - will have stars that can laugh." She added: "I love you. I miss you. I'll try to keep looking up." Williams had battled with alcohol and drug addictions since the late 1970s. He once said: "It (addiction) waits. It lays in wait for the time when you think, 'It's fine now, I'm OK.' Then, the next thing you know, it's not OK"
In the early 1990s he said the death of his friend and the birth of his son prompted him to quit drugs: "Was it a wake-up call? Oh yeah, on a huge level. The grand jury helped too." In 2006,however, Williams was reusing and checked himself in to a substance-abuse rehabilitation centre, later admitting that he was an alcoholic. Last month the star checked into an addiction centre in Minnesota for several weeks. "After working back-to-back projects, Robin is simply taking the opportunity to fine-tune and focus on his continued commitment, of which he remains extremely proud," his spokesperson said at the time, according to the US website TMZ. Williams is scheduled to appear in Night at the Museum: Secret of the Tomb on Dec. 19, 2014, playing the statue of Teddy Roosevelt who comes to life at night. Dubbed â€œthe funniest man aliveâ€ by Entertainment Weekly in 1997, Williams rose to fame while playing Mork the alien in the TV show Mork & Mindy, a Happy Days spinoff. Williams was perhaps best known, however, for his starring roles in classics such as Mrs Doubtfire and Good Will Hunting. He would go on to win the Academy Award for Best Supporting Actor for his portrayal of Dr S*** Maguire in Good Will Hunting. Most recently, Williams had his own TV show The Crazy Ones, in which he played the dad of Sarah Michelle Gellar. He was said to have been disappointed that the show was not renewed after its first season. Williams will appear in the third Night at the Museum film and was set to reprise one of his most famous roles as Mrs Doubtfire in the sequel to the 1993 movie. The stars of Mrs Doubtfire also paid tribute. On her personal website, Lisa Jakub, who played Williams' eldest daughter in the hit film, related a touching story of how Williams supported her when her high school kicked her out while she was spending five months on location working on the film. "When I arrived at work the next day, Robin noticed that I was sad and asked me what was wrong. I explained what had happened, and the next day, he handed me a letter that he wrote to my school. "He explained that I was just trying to continue my education while pursuing my career. He wrote embarrassingly kind things about my character and my work ethic, and requested that they reconsider and allow me to return to my classes." Although Ms Jakub's school did not allow her to return, Williams' support left its mark on the young actress. "Robin stood up for me. He was in my corner. I was only 14, but I had already seen that I was in an industry that was full of back-stabbing. And it was entirely clear that Robin had my back." Veteran Hollywood star Sally Field, who played Williams' wife, released a statement on the death of her co-star. "I feel stunned and so sad about Robin. I'm sad for the world of comedy. And so very sad for his family. And I'm sad for Robin," Field said, according to Fox 411. "He always lit up when he was able to make people laugh, and he made them laugh his whole life long.... tirelessly. He was one of a kind. There will not be another. Please God, let him now rest in peace." Mara Wilson, who was just five years old when she played Williams' youngest daughter, Natalie Hillard, in Mrs.Doubtfire, took to Twitter to express her grief at the loss of her co-star. "Very sad, very upset, very glad I did not have to hear about this through Twitter. Probably going to be taking some time off it for a while." Williams is survived by his third wife Susan and his three children, Zachary, Zelda and Cody. â€¢ Readers who wish to seek information and/or support on suicide prevention can call Samaritans 08457 90 90 90. So much talent and so much more to come - just gone. The Academy have paid what might be the saddest ever Twitter tribute to Robin Williams with three simple words: "Genie, you're free." I agree with comments above written. The American actor Robin Williams was found dead on Monday at his home in California. Authorities are investigating the causes of death, but early indications point to suicide by asphyxiation, according to Reuters. "At this point, the Department of Forensic Medicine of the Marin County Police suspect suicide by asphyxiation," reads the statement circulated today. According to the site specializes in Celebrity News Entertainment Weekly, which quotes the agent of actor Robin Williams was "fighting a severe depression" and is considered a "tragic and sudden loss." 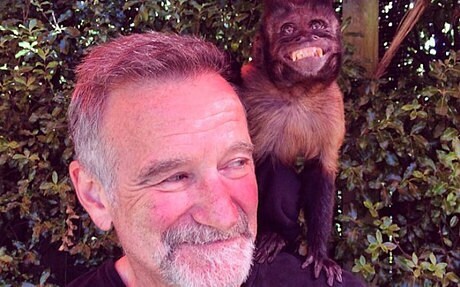 His wife, Susan Schneider, issued a statement which read:.. "'m Shattered On behalf of Robin's family ask for privacy at this time grief and mourning While we remember, we hope that the focus is not on death but on the Robin endless moments of joy and laughter that he gave millions of people ". Winner of an Oscar for Best Supporting Actor for his role in the movie 'Good Will Hunting' in 1998 (see video at the end of the text of the speech after winning the award), Williams was fighting a depression, having also given entry into a rehab a few months ago to stay sober. For more than 20 years that the actor did not consume drugs, after the excesses committed in relation to the abuse of narcotic substances. Born in 1951, throughout his career Robin Williams played several roles that are in movie history, such as the military Adrian Cronauer in "Good Morning, Vietnam" (1987); Professor John Keating in the film 'Dead Poets Society' (1989); and the homeless Parry in 'The Fisher King' (1991), where opposite Daniel Day-Lewis. These three films have earned him as many Oscar nominations - as in 1992 he was appointed to the movie 'The Fisher King' - but it was only in the skin of psychologist S*** Maguire, and with the responsibility of taming the 'Good Will Hunting' Matt Damon, who rose to stardom in Hollywood, achieving the Oscar for Best Supporting Actor in 1998. Robin Williams's career began on television. He debuted in the box that changed the world in the fifth season of the show 'Happy Days' ('Happy Days'), broadcast on ABC between 1974 and 84 Williams appeared in the episode "My Favorite Orkan", Mork playing the role of a alien sent from a planet (Ork) in which the comedy was prohibited. Eventually, the character gained such popularity that the actor was entitled to a spin-off, 'Mork & Mindy'. In this new series, sharing a room with Mork Mindy McConnell, a human who tries to give you some light on life on earth. But it was the film that Williams became known worldwide. The site specializes in statistics and information film Internet Movie Database records 103 credits that represent interests in films or television series, particularly in the last two decades, in blockbuster movies like 'Good Morning Vietnam' in 1989 or 'The Club Dead Poets' in 1997. His latest films to hit the cinemas were 'The Angriest Man in Brooklyn' and 'Boulevard', both released this year even though they have not yet been shown in Portugal. I always enjoyed the film "dead poets society: one of his best films, also jumanji, good morning vietnam". Vee8 wrote: He once said that suicide is a permanent solution to a temporary problem. What a talented actor he was. Such a creative person and he gave so much pleasure to so many. Sad isn't it that at a time in his life when most folk are hoping to be spared some years ahead to enjoy their lives, that he chose to end his. He battled long with his inner problems. erngath wrote: What a talented actor he was. "What a talented actor he was. Such a creative person and he gave so much pleasure to so many. A wonderful actor who gave so much pleasure to many". It's so sad I could hardly believe it when I heard the news. The Fisher King is one of my most favourite films of all times, he was absolutely brilliant in that. But I'm livid at how the tabloids are behaving, they're like sharks. No respect whatsoever for his grieving family & especially his three kids. I agree: "He was very talented. A big loss to his family and to the world of entertainment". Mobyra, I agree with you. "I don't know how much value I have in this Universe, but I do know that I made a few people happier than they would have been without me and as long as I know that, I'm as rich as I ever need to be."